A Few Tips for Fighting Winter Colds and Flu, plus a Safeway Gift Card Giveaway! Vitamin D! We are big fans of vitamin D in this house. I’m not a supplement kind of gal, but this is the one exception I make. Since my husband and I started taking vitamin D regularly, we have barely been sick. In addition to supplements, most dairy products are fortified with it. Throw used tissues away immediately. OK, I know this one is probably a no-brainer to most of you, but this something I never thought about much. When I’m sick, I let used tissues pile up on the table next to me as I lay on the couch blowing my nose and then I throw them all away when I get up to get a drink or something. Even worse, when we’re out and about and I wipe one of my kids’ noses, I often stuff the tissue in my purse until I can find a trash can. I inevitably forget them there and then they roll around in my purse rubbing germs all over my wallet, my phone, my pens — everything! Gross! No more though — those babies are going right into the trash from now on! Stay hydrated when you’re sick. We all know we’re supposed to stay hydrated, but I never knew exactly why. Aside from the general health benefits of proper hydration, if you keep your liquids up it can help to thin mucus which in turn keeps you from getting too stuffed up and keeps coughing to a minimum. Ask your pharmacist questions! I’ve never hesitated to talk to my pharmacist when I’ve had questions about prescription medications, but it never occurred to me to ask her about over-the-counter products. 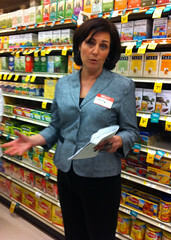 I was truly shocked when Dr. Vatanka (the pharmacist giving us the tour) told us that more than half of her time with customers is spent answering questions about over-the-counter medications. Since so many products are designed to treat multiple symptoms — fever, cough and stuffiness, for example — she recommended that we check in with our pharmacists when taking multiple OTC medicines to make sure that there won’t be some sort of harmful drug interaction. I will absolutely be doing this from now on. Safeway has generously donated a $50 gift card to one Wendolonia reader! Woo hoo! This gift card can be used at: Safeway, Vons, Dominick’s, Genuardi’s, Randalls, Tom Thumb, Pavilions, and Carr’s stores. Leave a comment on this post offering up your best tip for avoiding or dealing with winter cold and flu. I’ll close comments on Friday, December 2, 11:00 am PST and randomly select a winner shortly thereafter. If you win and you haven’t included your email address along with your comment another entry will be selected, so be sure to enter one on the form. The winner must contact me within 48 hours of being notified or another winner will be selected. Sorry, this giveaway is limited to winners with U.S. addresses only. I’m only counting comments as entries, but if you wanted to follow me on Twitter or Facebook I would think you were extra cool. Disclosure: I received a Safeway gift card and a grocery gift bag from Safeway in exchange for hosting this giveaway. I donated all of the shelf stable groceries to a local food bank, but we ate the perishable items. Have you donated to a food bank this year? I hope you’ll consider it!